However, the data of refugees admitted to Turkey shows that the HRW’s report is not accurate. 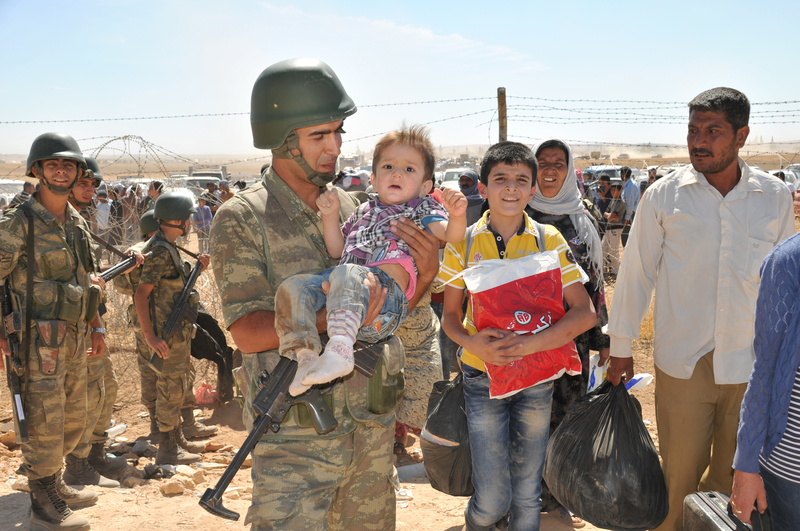 Turkey has maintained an open-door policy towards Syrian refugees who have been fleeing from the violence of the Assad regime and atrocities of terror groups such as the YPG and DAESH since 2011. There are 3,540,548 registered Syrian refugees in Turkey as of 2018 according to the data of Turkey’s Directorate General of Migration Management, making Turkey the largest refugee hosting country in the world. Since 2015, the alleged starting date of “Turkey’s continued refusal of Syrian refugees,” more than one million Syrian refugees have entered Turkey. This number is equal to the total number of Syrian refugees that all 37 European countries received since the outbreak of the Syrian Civil War in 2011. While the HRW report alleges that “Turkey summarily deports Syrian refugees back to Idlib Governorate of Syria since December 2017,” the number of the Syrian refugees who entered Turkey so far in 2018 is 91,886. In answering the HRW’s report, Turkey’s Ministry of Interior’s Directorate General of Migration Management emphasizes that Turkey’s borders are still open to the refugees given the continuingly increasing numbers of refugees who entered the country through the border gates. The Directorate General underlines that between 2014 and 2017, there have been 17 terror attacks in Turkey carried out by DAESH which left 307 people dead and 1,338 people injured. Between 2016 and 2017, 283 Turkish citizens were killed and 2,364 were injured in terror attacks carried out by the PKK and its Syrian affiliate the YPG. Some of these terror attacks were perpetuated by the terrorists who entered Turkey from Syria, disguising themselves as the refugees. For instance, DAESH targeted German tourists in Istanbul in a suicide bomb attack on 12 January 2016. It was revealed that the suicide bomber was of Syrian origin and entered Turkey while hiding among the refugees. Seher Cagla Demir, a Turkish citizen and member of the YPG, carried out a suicide attack in Ankara on 13 March 2016. The attack caused the deaths of 35 civilians and injured 75. It was later revealed that Demir went to Syria for training in the YPG camps and returned back from there by taking advantage of Turkey’s open border policy in the Syrian humanitarian crisis. The last major terrorist attack in Istanbul was in the nightclub Reina on the New Year’s Eve 2017. The gunman was Abdulkadir Masharipov, an Uzbek DAESH militant who had come to Turkey from Syria. Furthermore, Turkey arrested many foreign terrorist fighters mainly in border towns before they were unable to carry out terrorist attacks in Turkey or return back to their home countries which would allow them to pose security threats back in those countries. In light of all these events, Turkey had to limit its complete open border policy and started to accept the Syrian refugees in need through the predetermined border gates according to the statement of the Directorate General of the Migration Management of Turkey’s Ministry of Interior. Still Turkey continues to apply the open-gate policy and act in consistence with the principle of non-refoulement which obliges the host countries not to send the refugees back to the places where they would be subject of persecution. Turkey continues to provide shelter for Syrian people who had to leave their homes in masses. When Aleppo fell to the Assad regime in 2016 after intense clashes between the rebels and the regime supported by Russian airstrikes, Turkey prepared camps and welcomed more than 70,000 people displaced from Aleppo. Furthermore, while Western countries receive Syrian refugees after extensive background checks, Turkey accepted thousands without their identity cards and issued them temporary identity cards based on their declarations, so they would not face difficulties in their daily life and when dealing with the bureaucratic procedures.